Kids love to play with clay. They will squish, squeeze, pinch, coil, and press found objects into clay to make sculpture, food-safe dishes, and bowls. Students will create a personal name plaque to hang on their door. They will make unique prints using clay and paper. Self-expression and having fun is encouraged while improving their fine motor and visualization skills. 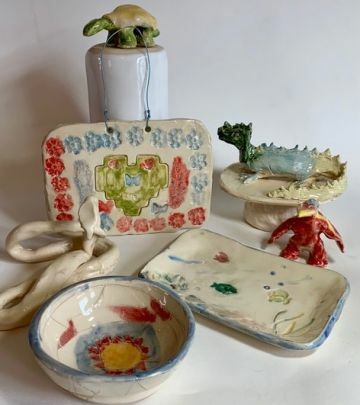 Instructor Candace Birchfield has over 25 years experience teaching kids the joys of working with clay. Fee: Member $150; non-members $175. Additional $25 materials fee paid to instructor on first class day. If you would like to register for SUMMER CAMP FOR KIDS - Clay Camp, ages 6 -11 please complete the form below.